When children ride on the vehicle's rear seats, activate the override switch. Otherwise, the children could be injured, e.g. by trapping themselves in the rear side window. Do not expose the child restraint system to direct sunlight. The child restraint system's metal parts, for example, could become very hot, and the child could be burned on these parts. Children could open a rear door from inside the vehicle. This could result in serious injuries or an accident. Therefore, when children ride in the rear always secure the rear doors with the child-proof locks. You secure each door individually with the child-proof locks on the rear doors. A door secured with a child-proof lock cannot be opened from inside the vehicle. When the vehicle is unlocked, the door can be opened from the outside. ► To activate: press the child-proof lock lever down in the direction of arrow 2. ► Make sure that the child-proof locks are working properly. ► To deactivate: press the child-proof lock lever up in the direction of arrow 1. ► To activate/deactivate: press button 1. 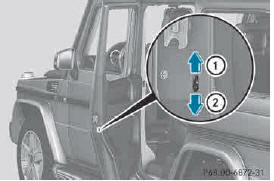 If indicator lamp 2 is lit, operation of the rear side windows is disabled. Operation is only possible using the switches in the driver's door. 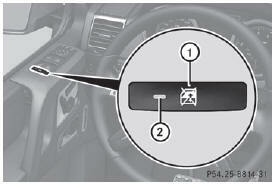 If indicator lamp 2 is off, operation is possible using the switches in the rear compartment.